Astrobiology is a complex, wide-ranging subject embracing biology, astronomy, geology, climatology, engineering, chemistry, computer modelling and, probably, a dozen other subjects I’ve not even thought of. It’s impossible for anyone to be truly expert in all these aspects and it takes a real optimist to attempt a synthesis. 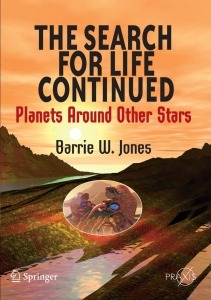 Barrie Jones is the quintessential optimist and makes a damn good attempt in this semi-popularization. The book’s organization is very much that of a textbook but the style and atmosphere invoke the best kind of popular science book; one that introduces you to new vistas. There are a few places where Barrie’s synthesis doesn’t quite get it right. I think he should be much clearer on the, very profound, differences between the last common ancestor and the origin of life. The very phrase last common ancestor implies that there were earlier common ancestors and it is clear that Barrie Jones understands this very well. Nevertheless, I did feel that he could have spelt it out more explicitly as some students might become a little confused if they did not read his text carefully enough. I also found one completely incorrect statement (woodlice are not descended from trilobites!) but, given the vast range of topics covered by this book, one howler can, I think, be forgiven. Moving on quickly to where the book hits all the right buttons, I was astonished by the clarity of his descriptions for exoplanet finding techniques. I now recommend this text to students on Planetary Geology courses at Royal Holloway as the best and the most accessible (translation: non-mathematical) place to read up on exoplanet detection. The most remarkable and memorable aspect of this book though is not its content but its spirit. The impression that remains with me now, weeks after finishing the book, is Jones’s extraordinary optimism. As I said earlier, you have to be an optimist to even attempt writing a text on such a subject but this book exudes optimism; optimism that the search for life is fascinating, worthwhile and practically bound to be successful. I wouldn’t disagree with “fascinating” or with “worthwhile” but I do have trouble with “bound to be successful”. At present we know of life on only one world. Given this, rather sparse, dataset it is logically possible that there are no other inhabited planets in the entire Universe and equally possible that there are millions of vibrant worlds within our Galaxy alone. Now, I’m notoriously gloomy on this question and so my thoughts should be taken with a large pinch of salt but, in my view, we astrobiologists tend far too much towards the “life here, there and everywhere” conclusion. Personally, I blame Copernicus. By demoting the Earth from its location at the centre of the Universe, Copernicanism put in train a sequence of discoveries leading, eventually, to our present realization that planets are common and stars like the Sun almost uncountable. Copernican ideas also led to the incredibly powerful concept that the laws of nature are the same here on Earth as they are everywhere else. As a result of all this, we 21st century folk have grown up “knowing” that we’re nothing special. So, if life can happen here it probably can happen in lots of other places too. I’ve no objection at all to this but I do think it has led to confusion between an idea I agree with (that there are a lot of inhabited worlds) and an idea I disagree with (that inhabited worlds are common). The reason these statements are not the same boils down to a simple fact: the Universe is enormous! Indeed, if modern inflationary models of the Universe are correct, the true scale of the Universe may dwarf the size of the little bit we can see (i.e. the bit out to objects that were 14 billion light years away when the light left them). Alan Guth, one of the originators of inflationary cosmologies, has suggested that the Universe may be 10^23 times bigger than the size of the visible Universe. A Universe on this scale would contain around 10^91 planets and so, even if only one world in a space the size of the visible Universe had life, there would be 10^69 inhabited planets in the Universe. That’s about the same as the number of sand grains it would take to fill our Galaxy! So, as I said, inhabited worlds could be both very numerous (i.e. the total is large) and very rare (i.e. there is a very low density) and, to me, this seems a very likely scenario. Of course, the numbers I’ve used above are entirely speculative and so I could be entirely wrong. Perhaps Barrie Jones’s optimism is well placed. Discuss (please! ), but first buy the book.